The bacterium Helicobacter pylori is strongly associated with gastric ulcers and cancer. To combat the infection, researchers at University of California, San Diego School of Medicine and Jacobs School of Engineering developed LipoLLA, a therapeutic nanoparticle that contains linolenic acid, a component in vegetable oils. In mice, LipoLLA was safe and more effective against H. pylori infection than standard antibiotic treatments. The results are published online Nov. 24 in the Proceedings of the National Academy of Sciences. 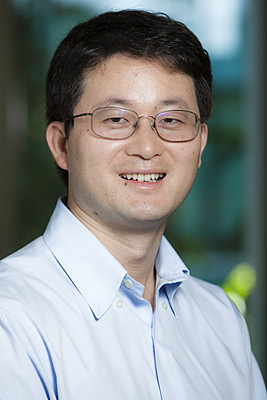 “Current H. pylori treatments are facing a major challenge — antibiotic resistance,” said Liangfang Zhang, PhD, professor in the UC San Diego Moores Cancer Center and Department of Nanoengineering. “Our goal was to develop a nanotherapeutic that can tolerate the harsh gastric environment, kill H. pylori and avoid resistance.” Zhang and Marygorret Obonyo, PhD, assistant professor in the Moores Cancer Center and Department of Medicine, are co-senior authors of the study. LipoLLA is a lipid (fat) particle that contains linolenic acid. When LipoLLA encounters H. pylori, it fuses with the bacterial membrane. Then the particle’s linolenic acid payload spills out, disrupting the membrane and killing the bacteria. Zhang, Obonyo and their team labeled LipoLLA particles with fluorescent markers, fed them to mice and watched as the particles distributed themselves in the stomach lining — and stayed there. After treatment, they measured bacterial load in the stomach and markers of inflammation. Compared to standard antibiotic therapies, LipoLLA was more effective at getting rid of H. pylori. What’s more, LipoLLA was not toxic to the mice and the bacteria did not develop resistance to the therapy. “This is the first step to verify that we can make this therapeutic nanoparticle and demonstrate that it works to reduce H. pylori colonization. We’re now working to further enhance the particle, making it more stable and more effective,” Zhang said. Co-authors include Soracha Thamphiwatana, and Weiwei Gao, UC San Diego. This research was funded by the National Institute of Diabetes and Digestive and Kidney Diseases (grant R01DK095168), part of the National Institutes of Health.